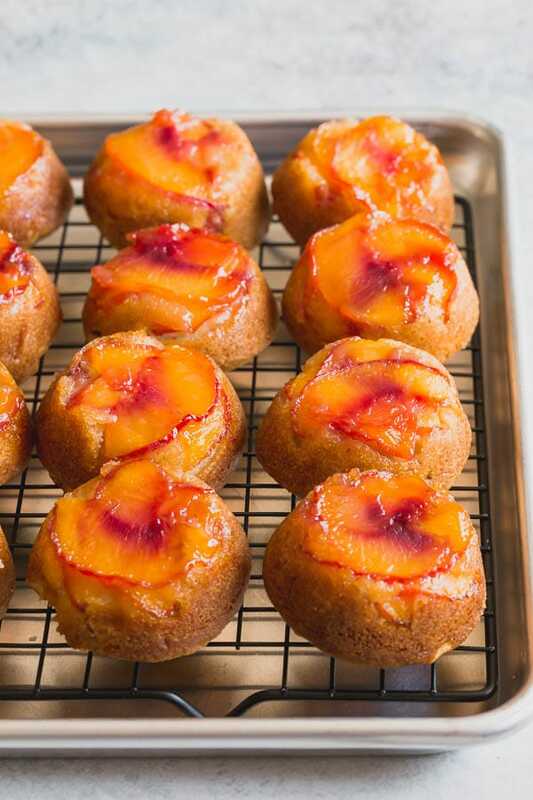 These super moist and tender peach upside down mini cakes are bursting with peaches in every bite. Easy to make, this recipe is a keeper for that indulgent peach season! I originally shared this recipe back in August 2014. I took new photos to update this recipe and bring it up front, because this recipe is a winner! Every summer I buy a few boxes of juicy peaches. Why so many? 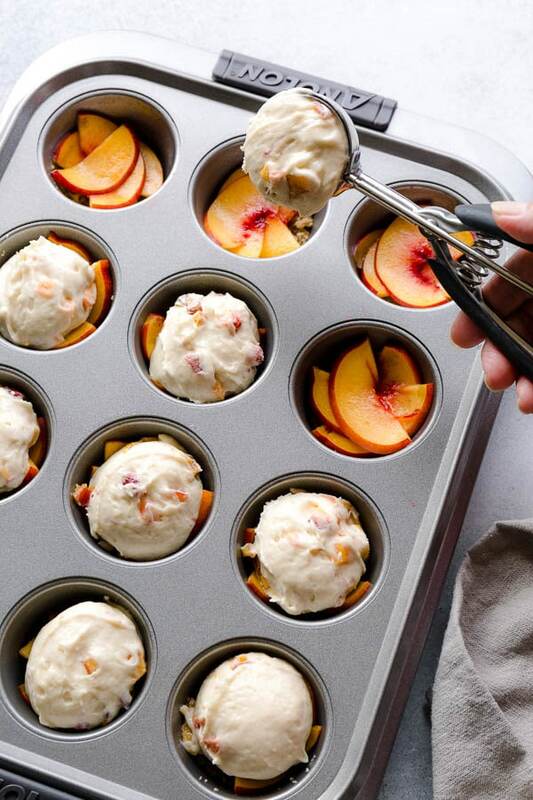 Because we love dehydrating peach slices to snack on throughout winter (ok, more like fall!). It’s a lot of work, blanching, removing skins, slicing and dehydrating for many hours, dried peaches are a labor of love! But they sure worth it. Of course, we enjoy them fresh as much as possible, and use them in iced tea and in baking. 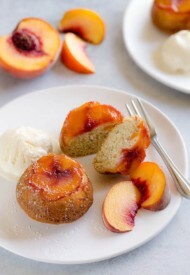 Today, I’m sharing these mini cakes loaded with juicy peaches. Every single bite bursts with juicy fruits, thanks to overload of peach cubes in the batter. 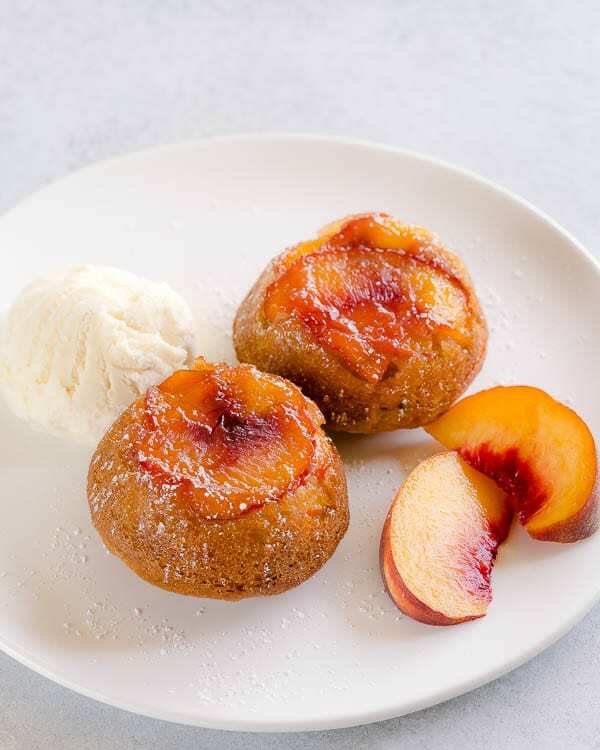 And you won’t even miss the frosting, as these mini cakes are topped with brown sugar glazed peach slices. Effortlessly beautiful presentation! You agree? Here is the step-by-step photo instruction for your viewing pleasure. Make sure to whip the butter/sugar/egg mixture really well, which means the mixture should be super fluffy and white. 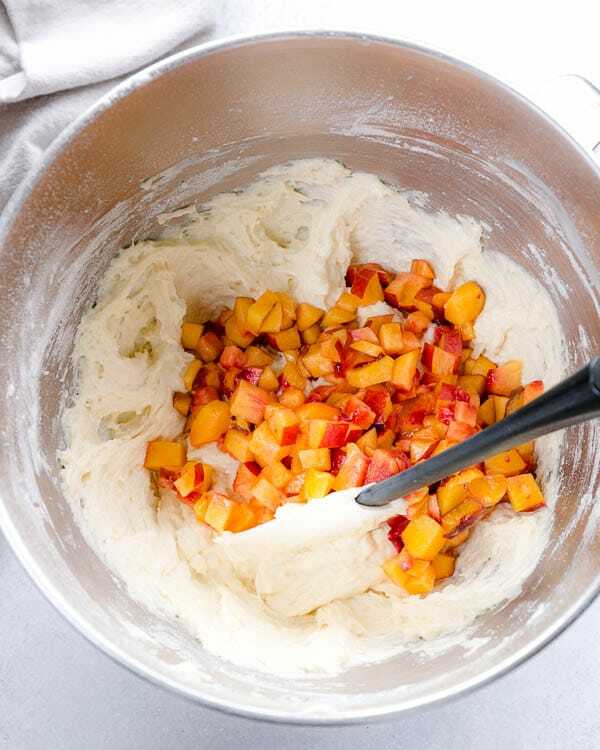 Once you incorporate the dry ingredients, add the peaches and give it a quick mix. I love using my large cookie scoop for filling the cupcake pans. It’s mess-free and yields uniform cakes. For an extra special treat, serve the cakes with vanilla ice cream. It’s quite a treat!! Preheat the oven to 350°F (177° C). Spray muffin pan with non-stick cooking spray. Divide 1 tablespoon of butter equally into 12 muffin cups. Sprinkle ½ teaspoon of brown sugar into each muffin cup. Slice 1-2 peaches into thin slices. Put about 3 slices into the bottom of each muffin pan. 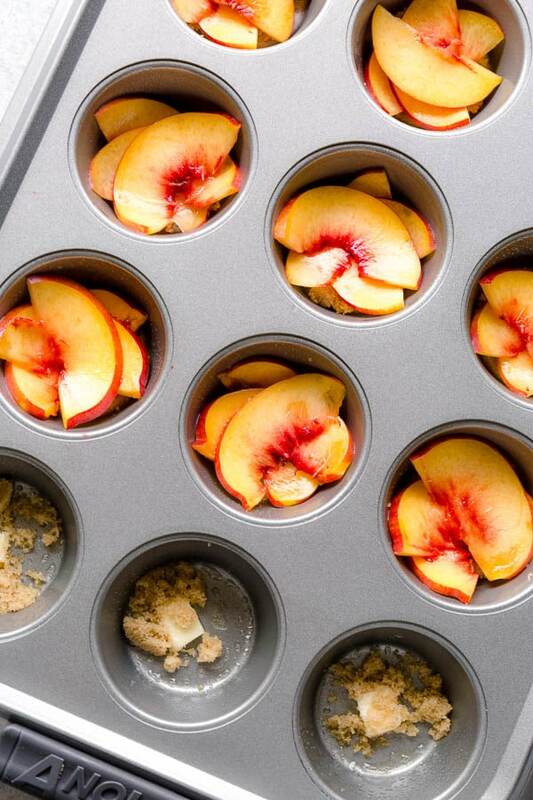 Cut the remaining peaches into small cubes. You should get about 1 cup of cubed peaches. Set aside. To make the batter, in a small bowl, whisk together flour, baking powder, baking soda and salt. 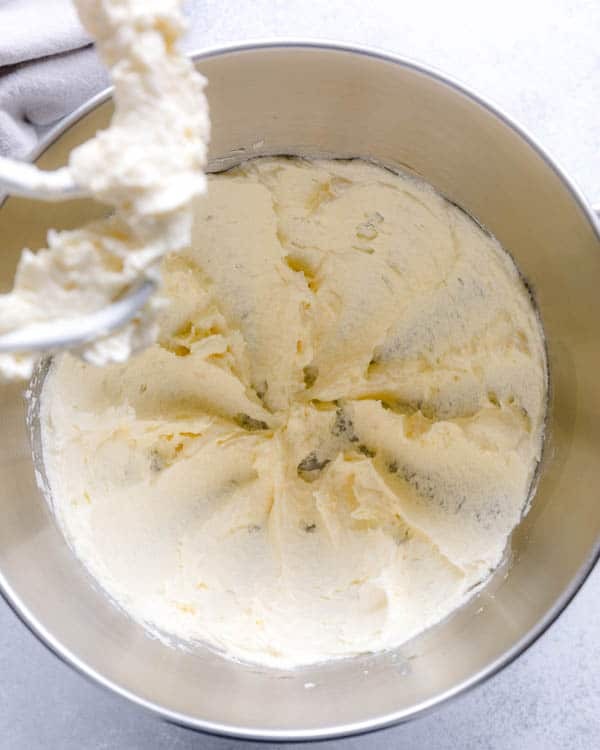 In a mixing bowl with paddle attachment, beat the remaining 1/3 cup of butter and sugar together until creamy. Add egg and vanilla extract and beat for another 2-3 minutes, or until well combined. The mixture should be fluffy and white. Add half of the flour mixture into the batter, beat for 1 minute. Stir in the buttermilk and beat for another minute. Add the remaining flour mixture and beat just until combined. Fold in the cubed peaches. Divide the batter into 12 muffin pan cups. I like to use this large cookie scoop. Bake for 25-30 minutes, or until inserted toothpick comes out clean. Cool the cakes in the pan for 5 minutes. Place the wire rack over the muffin pan and carefully turn the pan upside down to remove the cakes. Cool completely before serving.